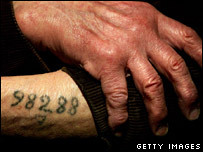 You heard me right….. Israel is denying holocaust survivors the means to survive. The meagre pensions they receive both from Israel and from German reparations is not nearly enough to pay their expenses, needless to say for food itself. Many of these people are literally on the verge of starvation. The very people that went through hell and returned are now once again in a private hell of sorts. The very state that owes its existance to the holocaust, the very state that constantly reminds the world of this and condemns anyone that dares deny it happened is treating those that suffered personally as if they are guilty of a crime. Perhaps a budget cut from the military can help the people involved. THIS article from the Magazine Section of the Jerusalem Post talks about the situation. Norman Finkelstein has been pointing this sort of thing out for some time but doesn’t get a lot of attension here in America. I guess there is a reason for that. I guess the reason is shame liberal white boy…. it sure isn’t something to be proud of.